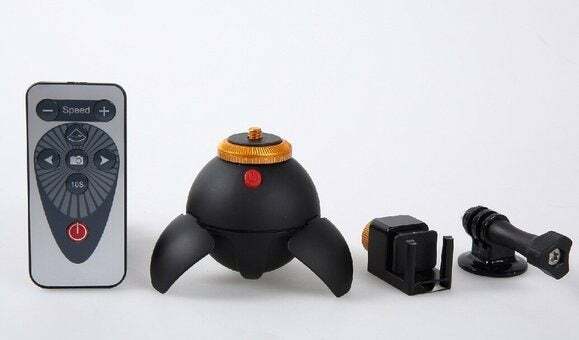 A pocket-sized, remote-controlled 360-degree view tripod for your smartphone or GoPro camera. Shooting a panorama on a lightweight digital SLR camera or GoPro-style action cam instead of a smartphone? You’re likely to have a difficult time producing decent results, even with the best of professional tripods. The pioneers of on-demand photography have come up with an ingenious solution to these problems courtesy of a small accessory that provides modern digital shutterbugs with a more expansive look on the cheap. 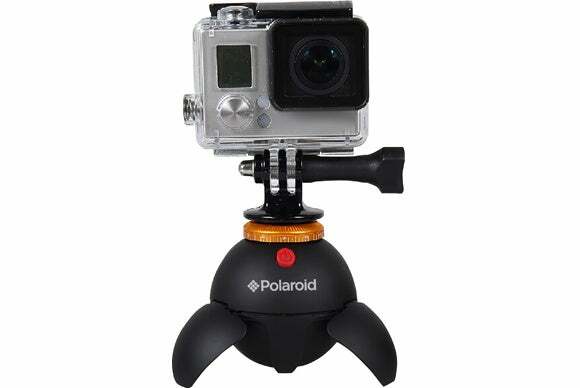 The Polaroid Remote-Controlled Panorama Eyeball Head ($50 on Amazon) is a roughly three-inch black orb with the company’s iconic logo emblazoned on the side below a red power switch. At the bottom is a quarter-inch threaded hole compatible with standard tripod heads; a bronze ring crowns the device with a male screw onto which a compatible camera is attached. If you don’t need a tripod mount, this accessory can also be used on a tabletop by extending three flip legs that look like small wings. Featuring a rubberized exterior, the device is solid and well-constructed, with a micro-USB port for recharging the sealed 450mAh battery in around eight hours; an indicator light on the internal circuit board turns red while charging, green when connected via Bluetooth, or blue when changing head direction. The only real limitation is that cameras weighing more than 18 ounces aren’t supported; they’re just too heavy for the diminutive internal motor that turns the Panorama Eyeball Head up to 360 degrees in either direction. At nearly 28 ounces with an 18 to 55 mm lens attached, this disqualified my Canon EOS Rebel T3i; it does work, but prolonged use feels like a sure-fire way to burn out the motor. Battery life is acceptable, with three hours in constant use or five hours of standby time from a full charge. You’ll want to turn the unit off when not in use or keep a USB battery pack on hand while in remote locations without easy access to AC power. Polaroid’s package is rounded out by an infrared remote, which allows the Panorama Eyeball Head to be controlled from nearly 17 feet away. It’s not a particularly attractive remote, but it gets the job done. The plus and minus buttons at top control the five levels of speed, from roughly two to five rotations per minute. At the center is a camera remote, which requires a Bluetooth connection to an iOS or Android smartphone. Pressing this button causes the shutter on the connected device to remotely trigger for hands-free use within a typical 30-foot Bluetooth range, and works equally great for front-facing selfies or rear-facing photos, videos, and panoramas. Leaving nothing to chance, Polaroid’s package includes two pieces of mounting hardware: One compatible with GoPro cameras, and an “other” mount for smartphones. Although photos and videos are best shot in landscape mode, it’s worth noting the second mount also works in portrait, perfect for panoramas; the mount thoughtfully includes enough space to access the home button. If you’re ready to supercharge your panoramic shots, the Polaroid Panorama Eyeball Head is an affordable way to get the complete picture from any tripod or tabletop. The Polaroid Remote-Controlled Panorama Eyeball Head provides a pocket-sized, remote-controlled 360-degree view for your smartphone or GoPro camera that can be used with any tripod.